This Middle Eastern classic with a healthful twist will become staple in your house! Chickpeas, also called garbanzo beans, are a great source of plant-based protein as well as complex carbohydrates and dietary fiber. They also contain a handful of nutrients, such as manganese, folate, or iron, making them a great option for maintaining proper blood sugar levels, improving digestion, and more. Maca, on the other hand, contains compounds capable of nourishing the endocrine glands to regulate the body's hormone production, thus relieving the symptoms of hormonal imbalance. Maca in this recipe can be easily replaced with sacha inchi powder for an additional protein punch. 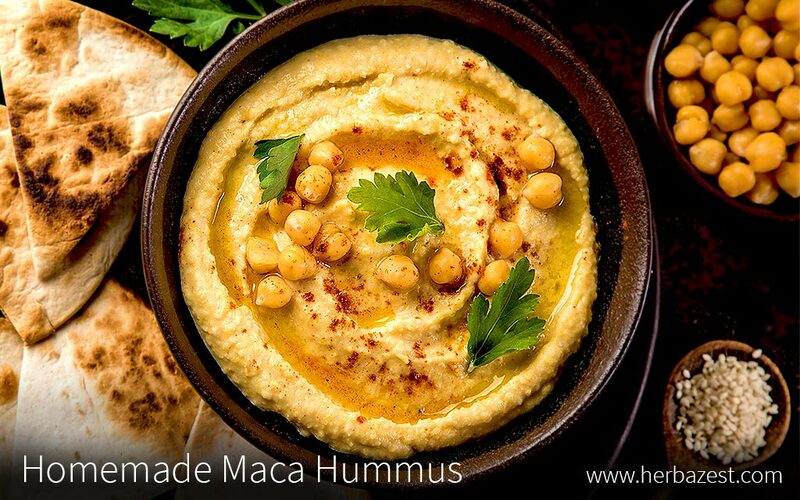 Besides pita bread, hummus goes well on homemade veggie crackers or maca bread as well as fresh vegetables, such as carrots, cucumber slices, or celery sticks.